My First Week Pt. 2! This is a continuation from my ‘My First Week Pt. 1’ blog post right here! Thursday, I finally got to meet Marti! She is the person that I have been communicating back and forth with ever since I started applying for the Basque Stage. I was really excited to meet her because I have been an avid follower of her blog bout the Basque Country, Blank Palate, and she is just filled with so much information about what’s going on around here. She is definitely one of the most interesting people I’ve got to meet! We met again at Xarma to meet up with one of the chef/owner, Aizpea, to talk about my time staging there. I find out I started work the day after! So soon but I was really anxious to get started and learning. 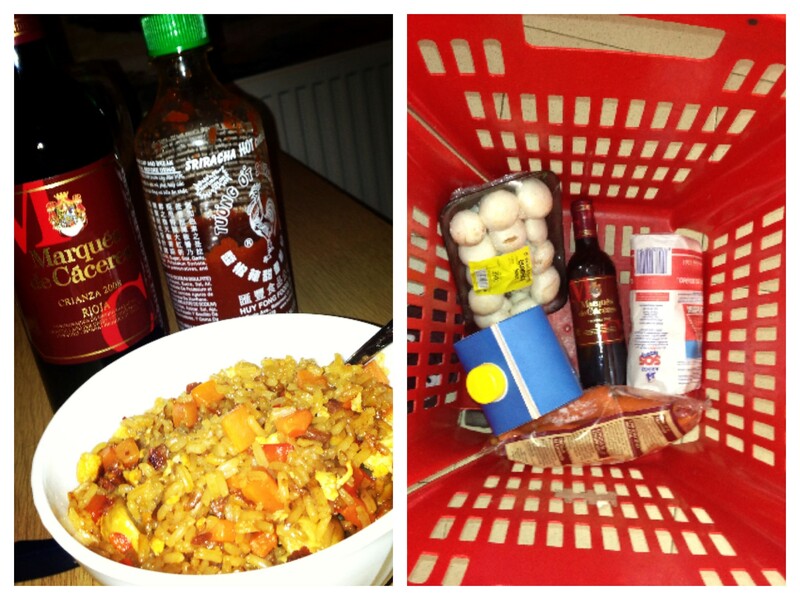 I ended up going grocery shopping for the first time the same night and got all the fixings for friend rice and a bottle of red wine. I thought it would be appropriate to treat myself with something familiar before my first day of work. 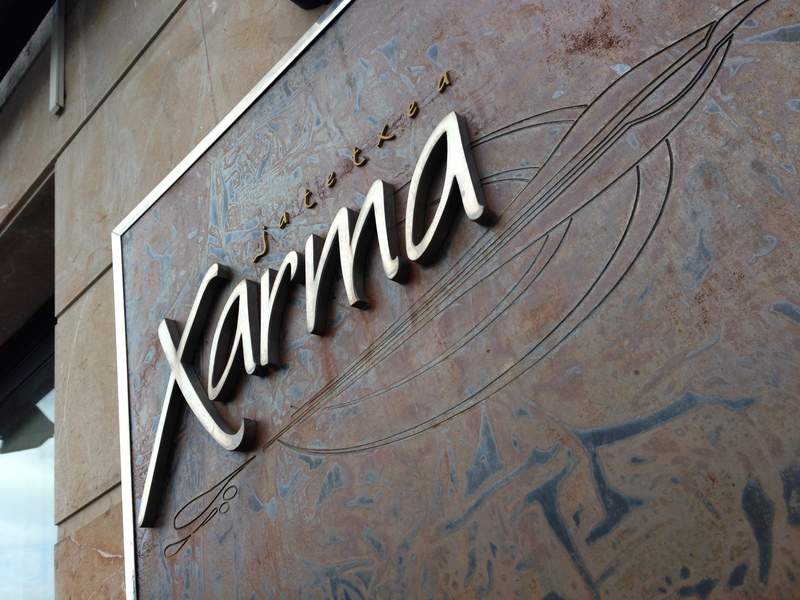 Friday and Saturday were my first two days at Xarma. That is all I have to share for now because this deserves a blogpost of its own, fo’ realsies! Sunday, Susy and I planned to visit Getaria for Dia Del Txakoli!!! 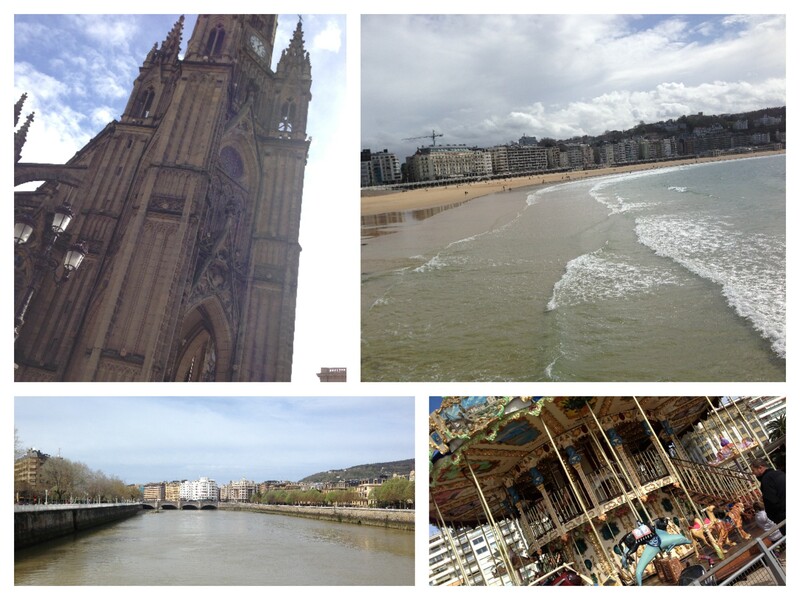 Getaria is a gorgeous town that is a 45 minute bus ride from Donostia. Dia del Txakoli, which translates to Day Of Txakoli, is the day where about 2 dozen wineries in the Designation of Origin Getariako Txakolina take part of a festival to share their latest crops of txakoli. Susy and I had found out about this festival through Viridian Farms. Viridian Farms is a farm based out of Portland that produces a lot of European products, especially from the Basque Country! We get a lot of product in from this farm at the Harvest Vine, so it was a great connection to have when I found out I was coming out here! They have been so great to us as they have given us a lot of great recommendations of what to do and where to go during our stay here in San Sebastian. Unfortunately, it seems that Susy and I didn’t really do our research and had gone to the wrong town. We had bussed all the way to Getaria to see no festival in sight. You could only imagine the confused looks on our faces. 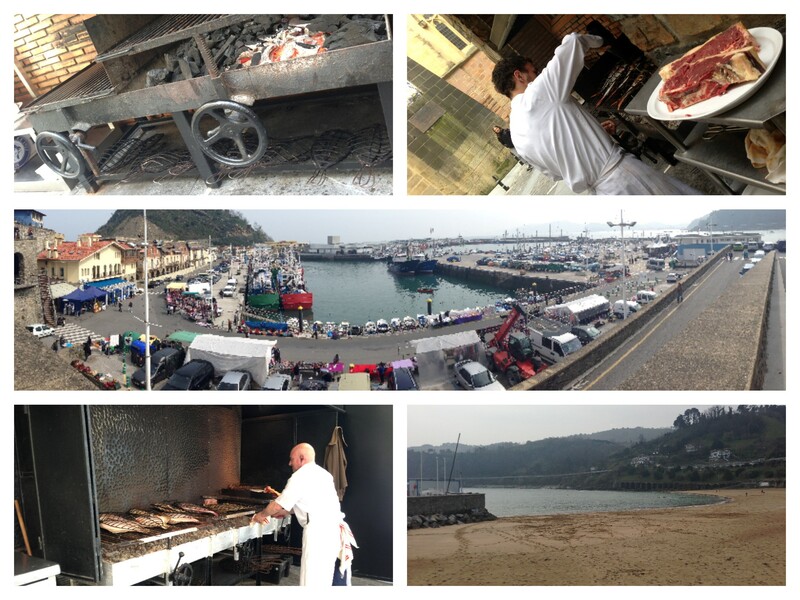 We later found out that the festival was actually in town of Aia, which isn’t that far from Getaria. But to 2 American kids that didn’t have internet access or have sense of direction, we kind of just gave up on making it to the festival. But regardless, Susy and I know how to make for a good time! Since Susy has already been to Getaria, she showed me around town. She took me to Anchoas Maisor. This is where fresh anchovies die and go to heaven. Literally. It is here where fresh day-caught anchovies forego a process of being cleaned then packed in a barrel of salt for about 6 months. Then they are taken out of the salt, desalted, then meticulously filleted by the expert hands of the ladies of Anchoas Maisor and then carefully packaged with oil to help preserve them. 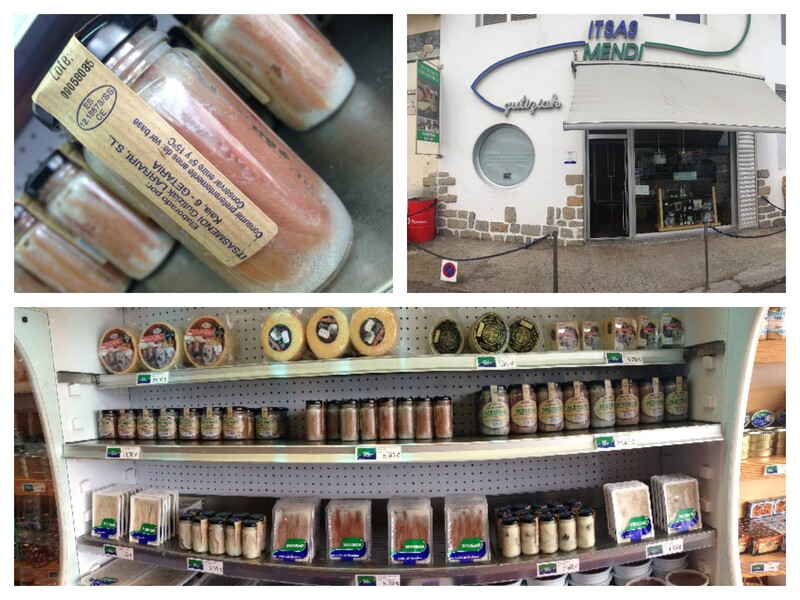 It is an amazing thing to see how much care and love that these people here have these delectable anchovies. And to think that not at one point in time, that these anchovies are ever mishandled or mistreated since all of this work is done by hand. Bravo to all of you over at Anchoas Maisor. 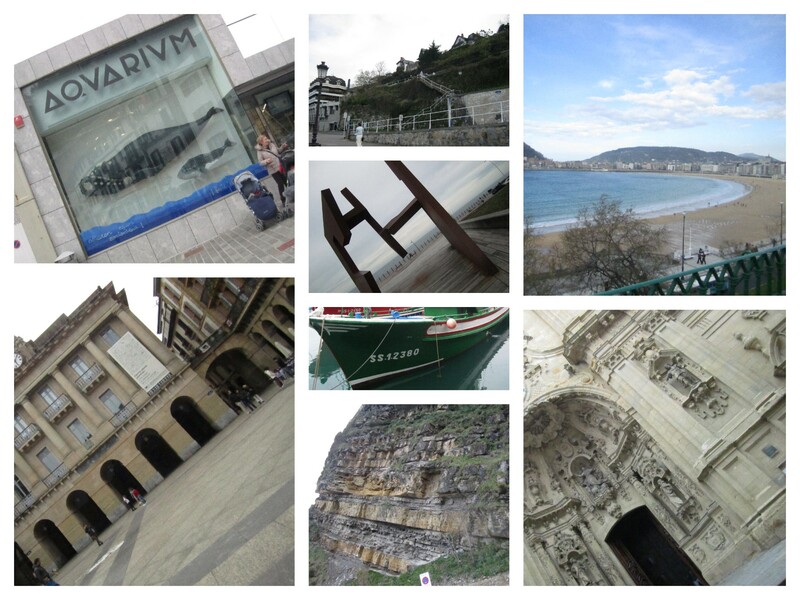 We then catch a bus and head to Zumaia, which is a town just 6 km east of Getaria. 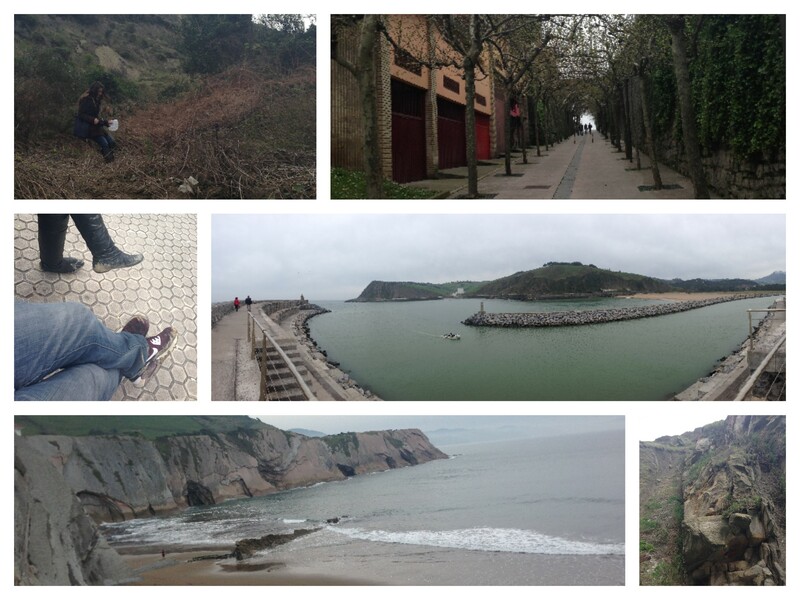 There was no reason to go to Zumaia other than the fact that its just incredibly gorgeous. It is a very scenic area that has some of the unbelievable views of the Bay of Biscay. We walked around a whole lot and ran into a little fair that was going on. Stopped by a churro stand and got a nice bag of deep fried yumminess. We make our way up to Itzurun, a beach on the most eastern part of the town that has a nice view of the bay that run into some caves off of the beach. We also get to this crazy pier that stretches right into the water and gives an amazing view of Zumaia. And at some point we try to hike around some cliffs to try to get a better view of the water. But all that got us is a couple pairs of really muddy shoes! 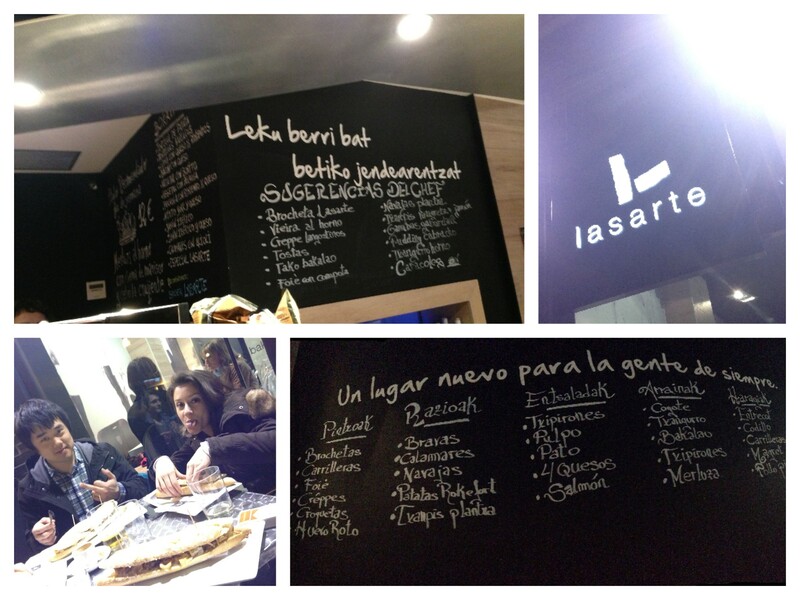 On Monday, Susy and I met up with Marti, Nacho, and Andoni in San Sebastian for a good ol’ Pintxo crawl for my Welcoming to the Basque Country! 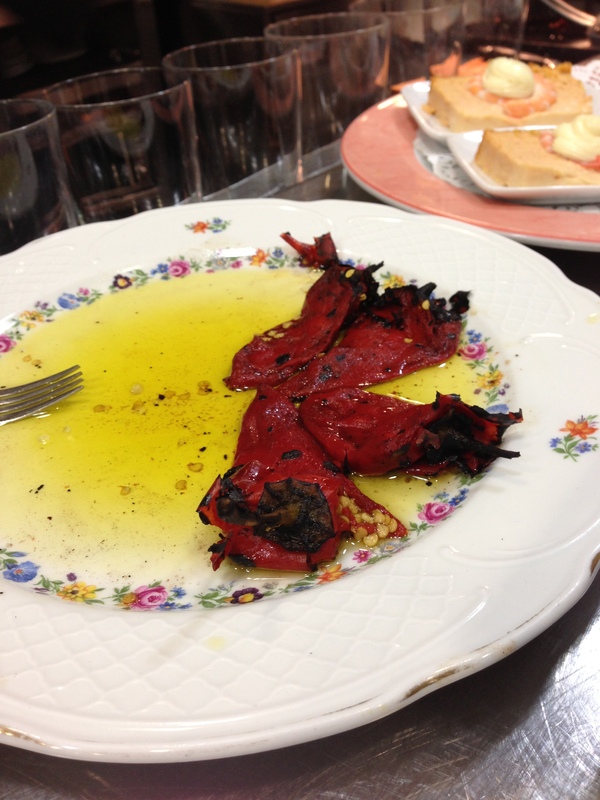 We start off at Bidea Berri, one, if not, the only pintxo bar that serves grilled fresh piquillos. My god, were these good. 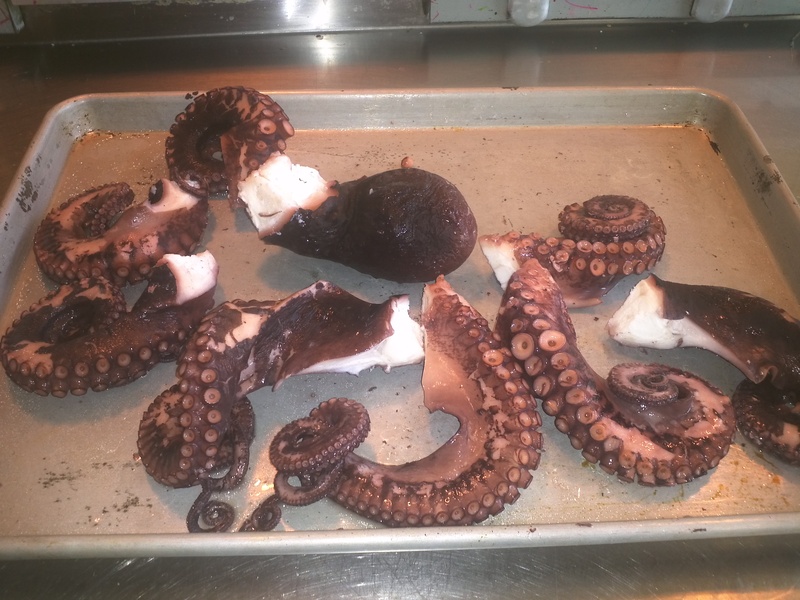 Simply charred and then peeled and doused in a good amount of olive oil. Simplicity at its finest. 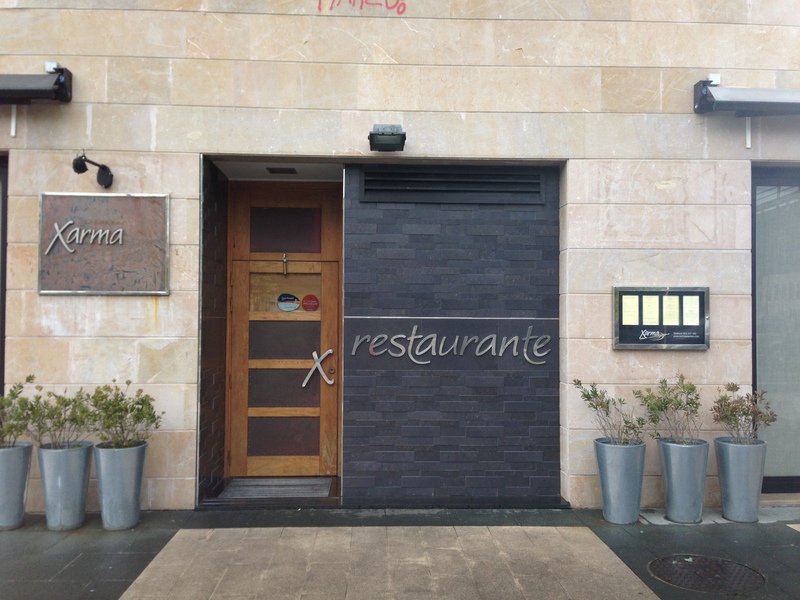 The next pintxo bar we go to is Bodega Donostiarra (well, I think. I did not get a picture or remember the bar name!). Here we got a variety of pintxos from Pulpo a la vinagreta, chorizo, Jamon Tortilla, and a potato pintxo that we called montaña de la mayonesa, which translates to mountain of mayonnaise. It was basically that with a slice of jamon and an anchoa olive on top. It may have been a little over the top, but definitely was tasty with some crusty bread to sop up all that alioli up with. Our last spot was Atari. I’ve actually been to this spot a lot on my breaks between services at Xarma. 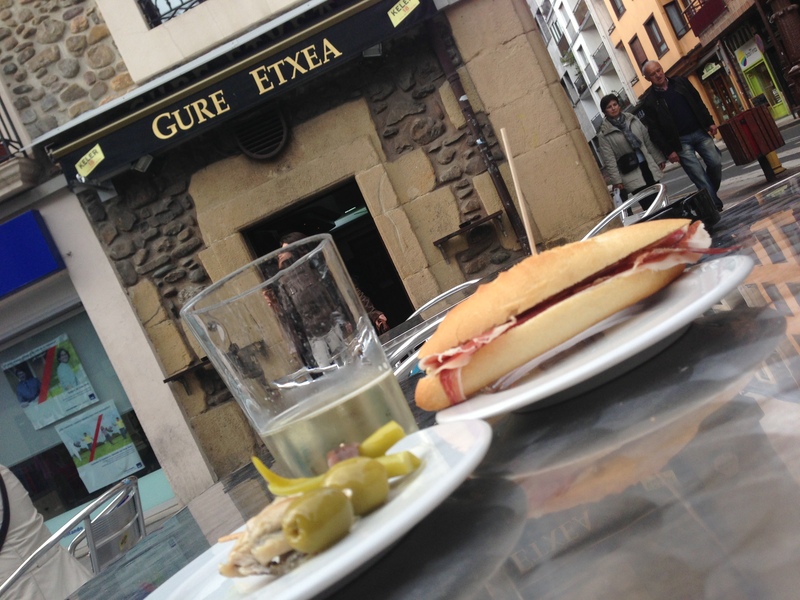 I usually come during the downtime so I just get a couple glasses of txakoli and a café con leche then back to work. Here we wind down and the girls both order dessert, but I order savory because I was still in search for the best croquettes in town. I order just a small portion of croquettes de bacalao. They were tiny in comparison to other croquettes I have gotten, but I’ve got to say that they were extremely creamy and did not have that dense texture that I have seen in majority of the croquettes I have experienced. They were exceptionally delicate and the flavor was delicious! Nacho ordered the foie gras terrine. Its accoutrements were rather interesting as it came with a banana puree, apple, and a red wine reduction. The terrine in itself was perfect. Probably the best foie terrine I’ve had recently. It paired well with the apple and the wine reduction, but the banana puree kind of just throws everything off. Nevertheless, it was a really great dish and I have no room to complain. You get two huge slices of Foie! This was an amazing night to really welcome me into this great city. I couldn’t have asked for better company and even better food. I am so grateful and appreciative for this opportunity that these guys at the Basque Stage and Sammic have presented me with. Just like the open arms that these amazing folks welcomed me with, my arms are stretched wider than the biggest seas to welcome whatever adventures and obstacles the next 3 months bring to me here in the Basque Country! There Is A Heaven. Believe Me, I’ve Seen It. So after 3 connecting flights from Seattle through Chicago, Boston, and Madrid, I finally made it into San Sebastian. Surprising, my flying experience wasn’t as brutal as I thought it was going to be. Thank goodness! I arrived at San Sebastian Airport and was instantly spotted by Andoni, one of the people who help out with the Basque Stage. I grab my luggage and then we were off to see San Sebastian for my first day as a Basque Stage Rising Star! There is a heaven. Believe me I’ve seen it. This place is unbelievable. That is basically the best way I can describe San Sebastian. Yeah, it’s been only about a week, but i’m still in disbelieve that I’m actually here. This is the one place I have been wanting to visit ever since I started working at the Vine. And now that i’m actually here, it’s like i’m getting to see this amazing country in High Definition. It’s all so real. 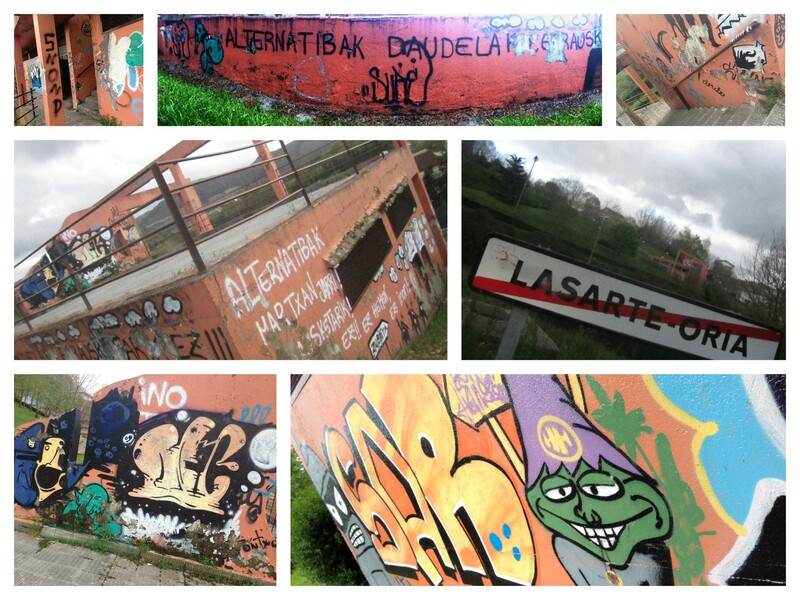 So upon my arrive in the Basque Country, I was ready to just see everything. Without any plan Andoni and I left the airport and made our way to where everything is happening. I had a real great time with Andoni as he showed me around town. 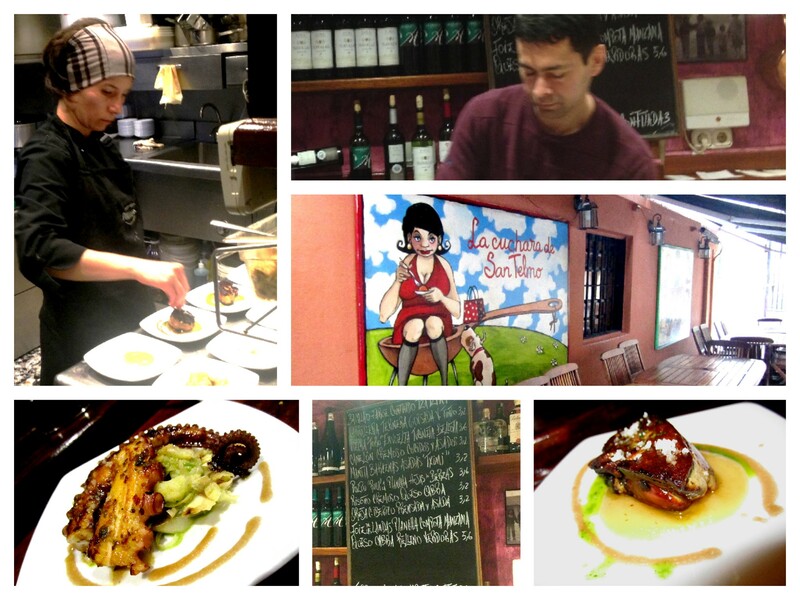 The first place he took me was to one of his favorite pintxo bars called, Borda Berri. He recently just had surgery so he had the pleasure of watching me scarf down couple plates of pintxos and a nice glass of txakoli. I was pretty excited that I was able to understand most of the menu. I surprisingly wasn’t too hungry from being jacked up after a 14 hour flight. 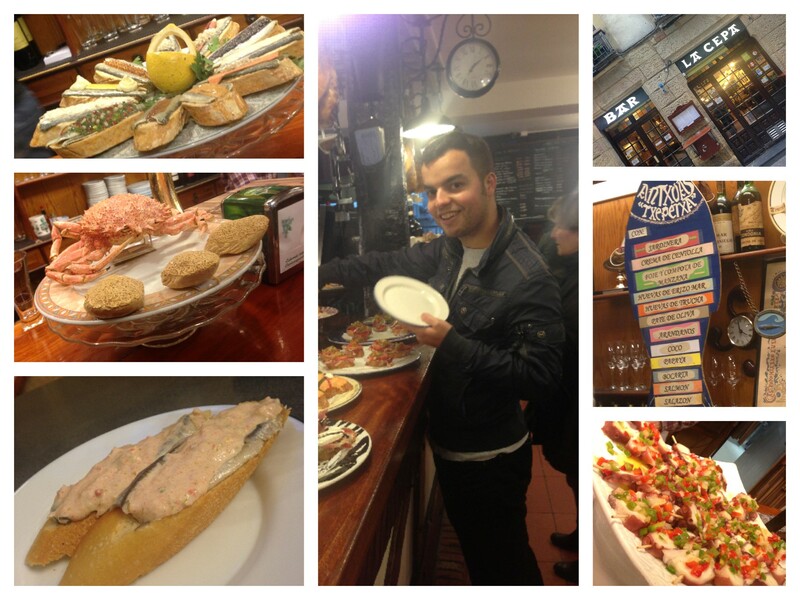 So I only started with two pintxos. Andoni recommended the Kebab de Costilla de Cerdo, but they were sold out of the already unfortunately. But that’s alright. It gives me another reason to return and try it later! 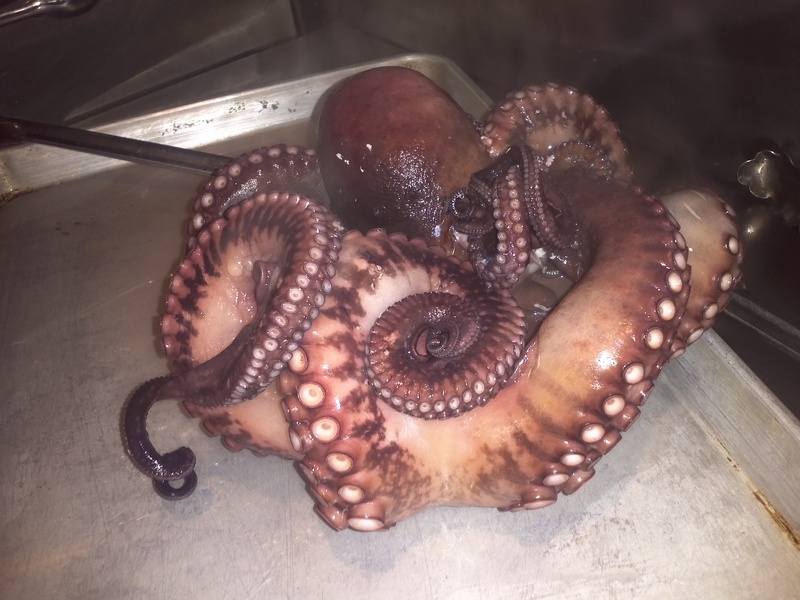 So I ordered the Pulpo a la plantxa con membrillo (Octopus seared on the plancha with quince paste) and Arroz Bomba con Txipiron-Maiden (Bomba Rice with Calamari). After I put in my order, I order a glass of txakoli while I wait. Andoni fills me in about San Sebastian and I express to him how excited I am to finally be out there. The food then comes and I start indulging into my first bites in Spain. Both dishes were really great. Seasoning was pretty spot on. The seafood was cooked perfectly. And a lot of surprises in each and every bite. 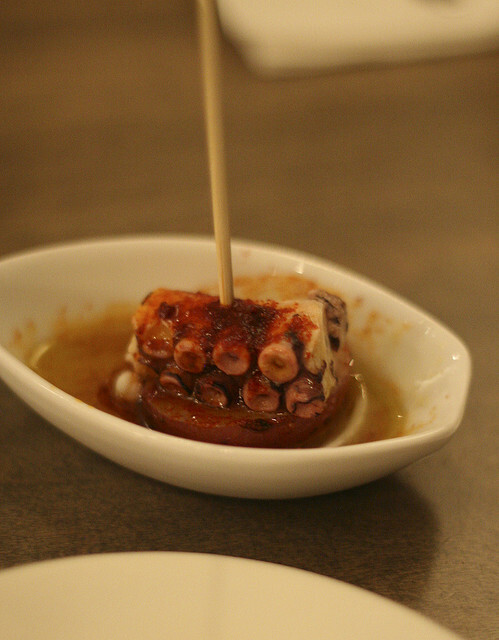 I have never really seen pulpo paired with quince paste but it was delicious. 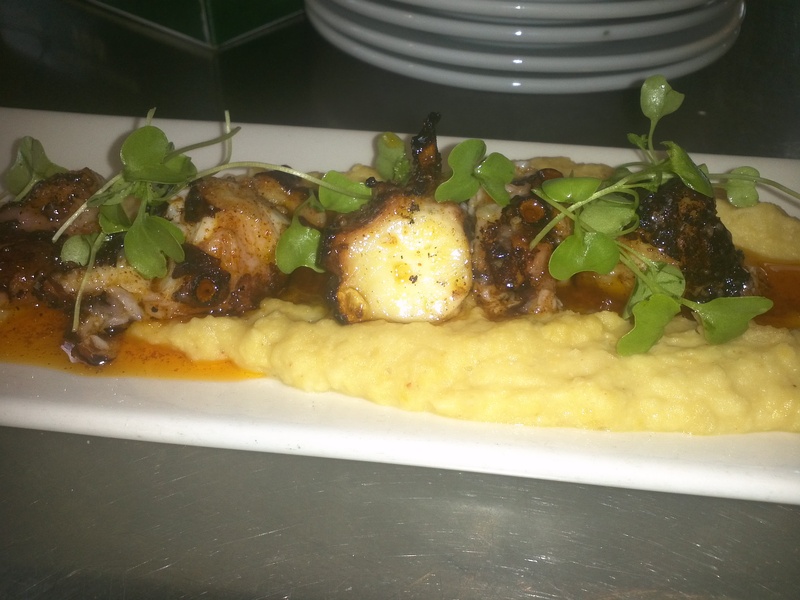 The flavors were perfectly balanced between the creamy potatoes, pimenton oil, alioli, and ever so tender octopus. And each bite that had membrillo was just so new and refreshing that I really think that it is a matched in heaven. 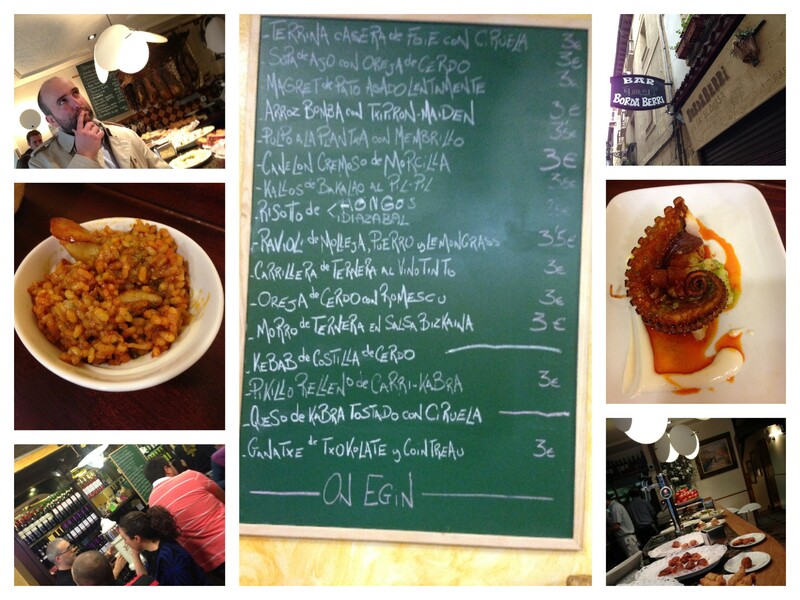 It is definitely the best octopus dish I’ve had so far in San Sebastian. 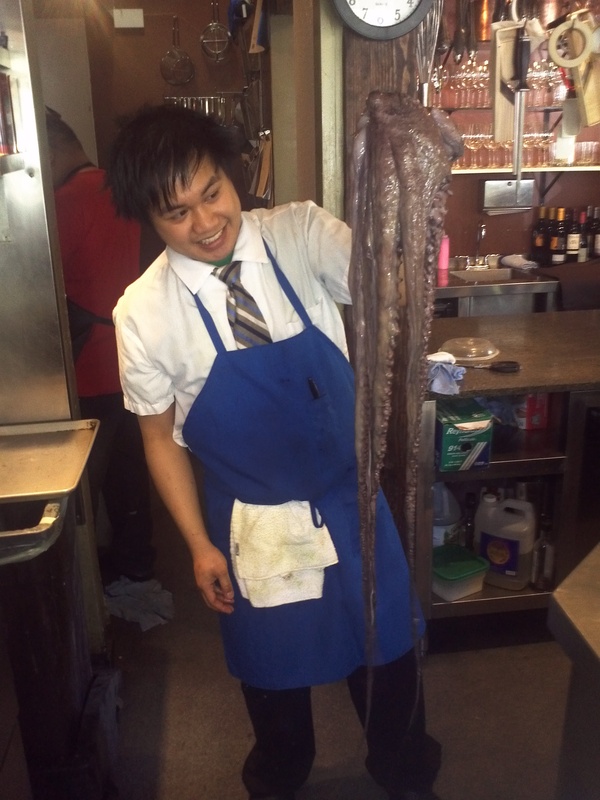 The calamari dish was really delicious as well. 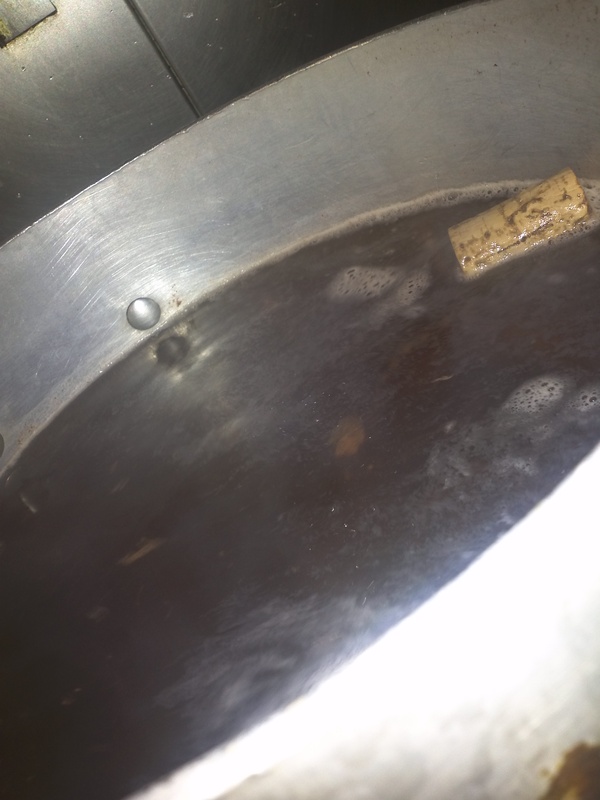 After the first couple bites, I really felt like that the dish really could have benefited from a nice squeeze of alioli, but then I reached to the bottom of the bowl and there laid a pool of it! I was so happy because it really turned a good dish into a really amazing one. We then headed out and walked down more streets of the old part of San Sebastian. We stopped in another pintxo bar for one more bite. 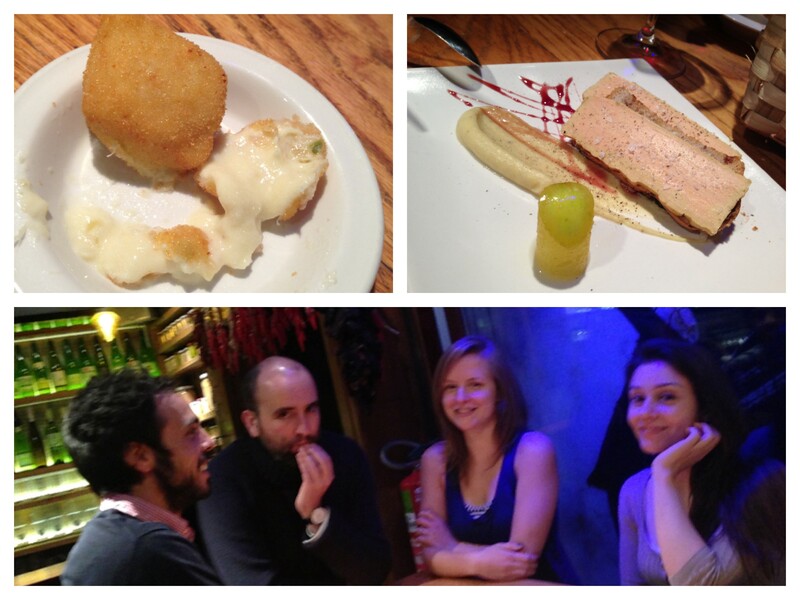 This time a pintxo with a hake and monkfish mouse with alioli on top of toasted bread. This was extremely delicious as it had a very mild fishy flavor and had a super light and creamy texture. It was like eating a fish rillette cloud. Andoni then proceeded to show me the more of San Sebastian and took me to the docks that overlook all of La Concha. Luckily, it was a gorgeous day. Apparently, it had rain the majority of the past 3 months so it was nice to get to see everyone out and about. The view was gorgeous and it left me speechless. Later we met up with my new roomie, Susy Santos, who is the Basque Stage Top Chef winner, as well has the previous Basque Stage Rising Star winner, Clifton Su. They have been here in the Basque Country for the last 3 months and I have been able to read their amazing experiences on their blogs. Sadly, Clifton flew back to his home in Cali the next day, but I was really glad to meet the guy behind the keyboard. 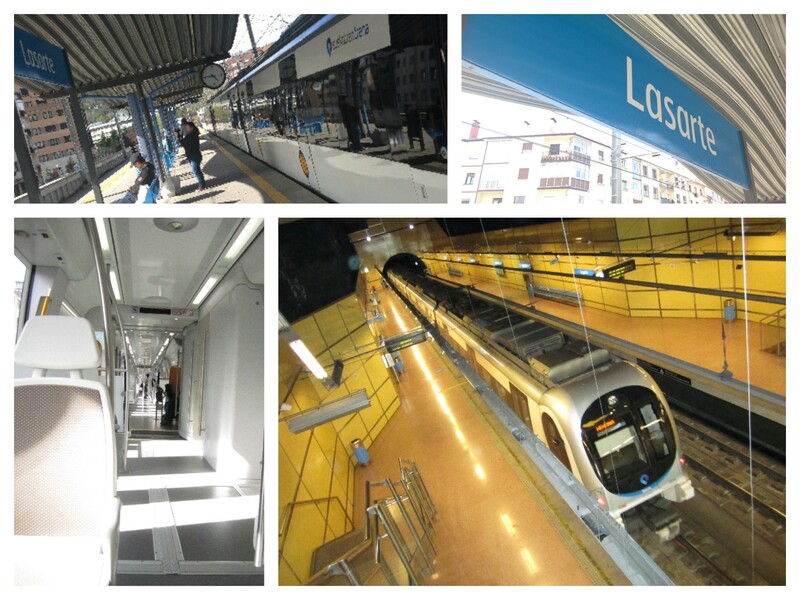 We then headed back to Lasarte-Oria, my new home. 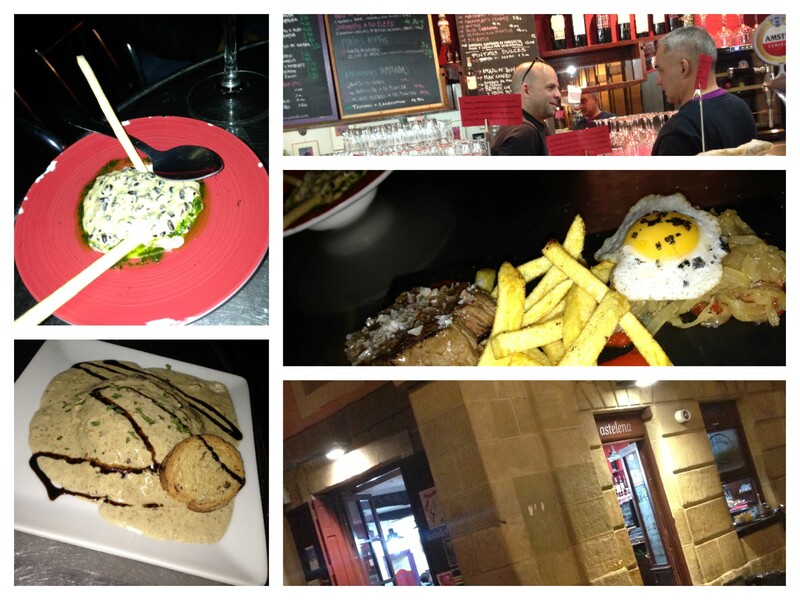 We all hung around for a couple hours and then we went out to Lasarte, a bar that is close to our apartment. We all ordered a Calamares con Alioli. This was basically a deep fried calamari sandwhich that is slathered with the famous garlicky alioli. It was huge and so good. Lasarte is definitely a cool place and will be my go to bar whenever I need a quick trip out of my home. We all head home and then it was lights out since Clifton had to head to Bilbao at 4 to catch his flight at 6:30. 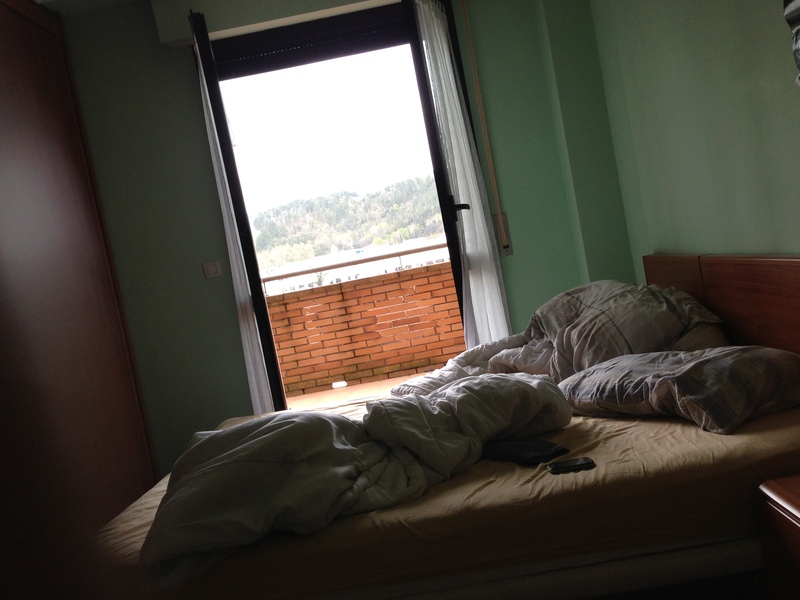 This was how my first day went in San Sebastian. It could’t have been more perfect as it was filled with good company, beautiful weather, and some great food and wine. I am ready for the Basque Country and all the adventures that it’ll bring. 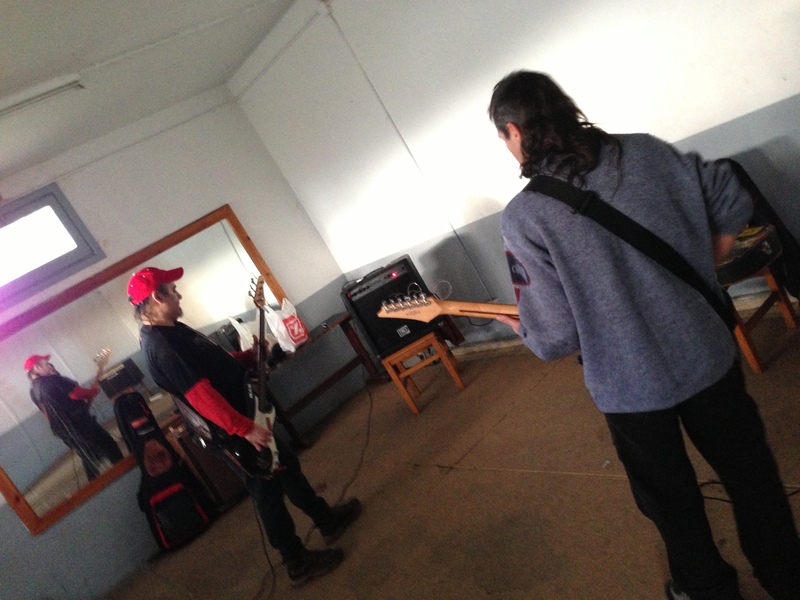 Til next time…..